≥ 50 image buffer. In 14-bit RAW. 😂 Nailed it. The D500 never misses a shutter actuation. It’s beautiful. I’m pretty sure it’s ruined all lesser cameras for me. I can’t stand anything that doesn’t take the photo when I press the shutter, nor anything which fails to keep taking photos until I decide to let go. ≥ 10 FPS. I’ll even accept complete viewfinder blackout if it means getting beyond 10 FPS. Sony actually have a new 28 MP sensor that is capable of 18 FPS read-out. I’ll take it. 🙂 10 FPS it is. Viewfinder blackout isn’t too bad, but isn’t great either. 18 FPS would have been awesome, and Sony have since demonstrated that you can get 24 FPS in a full frame sensor, so Nikon are still a bit behind, but admittedly 10 FPS does cover my needs most of the time. UHS-II support. And if I can actually find a card that can really do 300 MB/s, I expect my camera to write at that speed. None of this half-arsed 60%ish crap that all the UHS-I Nikons have. 😁 XQD and UHS-II support. With good cards write speeds are indeed very fast. I can’t complain here. Lower noise. Across the range, not just at high ISO. ISO 100 isn’t as clean as I’d like, and I’d really love to be able to use ISO 3200 or above in typical use. Bonus points for pushing the native ISO lower (50’d be nice, at least). 😕 Not so much. ISO 100 definitely isn’t cleaner than any other recent Nikon DX camera – even the D5x00 line, let-alone the D7x00. And high ISOs to my eyes simply aren’t any better – in noise, dynamic range, or colour – either. More, smaller autofocus points, that fill the frame. Just give me a few hundred in an even grid. All cross-type, all f/2-optimised at least, and all good down to f8 and -4EV at least. And better autofocus generally. 🙂 There are indeed a lot more points, with slightly wider coverage, and AF performance is marginally better overall on all those points. Plus f/8 to -4EV support on quite a few. So mostly positive. However, they’re no better at wide apertures than the predecessors, sadly. Continue to expect frequent focus failures at f/2 or wider apertures. Possibly this just can’t be fixed in an SLR (as opposed to a mirrorless design). On-sensor phase detection autofocus. I’d actually be rather interested in a mirrorless DX F-mount body, but even with a traditional DSLR, I want usable autofocus when shooting video. I’ll make it easier for you, though – I don’t need hundreds, or the high light sensitivity of the ‘viewfinder’ PDAF points. Just give me some, at least. 😩 Nada. Zilch. Zip. Fail. Let me adjust shooting settings in video mode (aperture, for example). While recording, too. 😐 Sort of. I still somehow, sometimes, end up in scenarios where it won’t do what it’s told in video mode. Plus it still insists on changing settings somewhat arbitrarily when I switch between video & stills mode, which is a frequent and frustrating source of exposure errors and lost moments. ≥ 4K video @ 60 FPS. At serious bitrates – at least 200 Mbps. Preferably with a H.265 encoder option. 😕 4K yes, but only up to 30 FPS, and not at particularly high bitrates. And still no H.265. It’s hard to be too critical, because overall video quality is massively better than the 1080p on all its predecessors, but it’s still no match for notable video-oriented cameras (e.g. Panasonic’s GH4 & GH5, or many recent Sonys). And/or, full-sensor read-out video. I’d accept being stuck with 1080p60 if it were at least from the full sensor. But it still has to have higher bitrates than today’s mediocre offerings. 🙁 Nope – pretty severe crop in 4K mode. This has been challenging in some of the video productions I’ve filmed, where it’s simply impossible to get rectilinear wide-angle video out of the D500. Even using an 8mm diagonal fish-eye lens, and its distortions aside, doesn’t really give you the ultra-wide experience. Put the top-plate LCD back the way it was, on the D7100. What the hell, D7200? What the hell? 🙃 I forget what my complaint was with the D7200 top plate LCD… but the D500’s top plate LCD works nicely, and I have no complaints about it. So success, either way. Quieter shutter. Something more like the D810, or better, preferably. 😔 Nope. Still a loud clickity-clack. On the upside, it comes across slightly moreso ‘impressive’ than merely annoying, at 10 FPS. No, SnapBridge doesn’t count. It’s #%! @ing useless. It records the wrong coordinates almost all the time. It’s ridiculously laggy – associating GPS locations from hours prior with some photos. Absolutely a disaster. Deeper, wider hand grip. My fingers are in fact more than an inch long. How ’bout that. 🙂 Yep, the grip is improved, along the same trendline as all Nikon’s more recent DSLR. Though it’s not actually wider – narrower, if anything – it is significantly deeper, and that works too. Moar pixels! But honestly, only if it’s amazingly more (≥ 40 MP) or otherwise at no noticeable cost w.r.t. image quality, or performance. 🙁 Alas no. 21 MP isn’t too bad, but it is very slightly noticeably less real-world resolution than the myriad 24 MP Nikon DX DSLRs that preceded it. And it really pales in comparison to the new D850, which has shown you can have quite a bit more of your cake & eat it too. Real weather-sealing. Pentax are kicking your arse here. I should not have to bat an eyelid at rain. I should be able to test Sigma’s 150-600 S and have it fail from moisture or dust damage before the camera body. 🤔 Maybe. I guess I’m not willing to experiment too rigorously with this. It’s certainly claimed to be significantly more weather-resistant. 😒 Sadly no. For the most part the extra weight doesn’t bother me, but it does add up, and it does hamper the user experience a little bit. Wider, more recessed viewfinder cup. I shouldn’t have to force my face through the camera in order to see the whole frame, nor buy third-party cups to actually block out glare. 😐 Somewhat. The viewfinder is indeed very nice & big by contemporary standards – even full-frame contemporaries – and that does make a big difference, which must be given due appreciation. But, the eye-cup itself is still basically non-existent, so glare and light leakage remain ever as problematic as before, and really demand not-entirely-cheap accessories to fix. High-speed video options (> 60 FPS). But only if it’s at usable resolutions – none of this “400 FPS but only at a tiny resolution” crap like the Nikon Vn series. Even little tiny GoPros can do this. Seriously, you should be ashamed of yourselves. 😞 Apparently high frame rates in general – even just 60 FPS, let-alone anything you’d really consider “high” – weren’t in their design goals. Not a big deal compared to most of the wishlist items here, but still a bit disappointing not to have. Magnify the viewfinder image in 1.3x mode. I really want to like and use 1.3x mode, but it feels so pointless today. 🙁 Still nothing here. And the extra 1.3x crop doesn’t even boost FPS like it did on the D7x00 line, and buffer sizes are so gloriously large that you needn’t shrink your files on their account, so there’s very little point to it. If you’re worried about SD / XQD card space, or disk space, I wonder if the D500 is the right tier for you anyway (you can get a lot of hard drive space – like, 50+ TB, for the price of the D500 body alone). Dedicated AF-ON button. Sometimes I actually want to use the AE-L button for its labelled purpose. Just give me two damn buttons already. 🤣 Not just this, but they actually made a whole dedicated AF joystick. Above & beyond on this one. The joystick is a tad fiddly w.r.t. pushing it for autofocus engagement vs swiping it for point movement, but still, I like it. And, they let you map different autofocus modes to different buttons, so you can have something like four AF-ON buttons, essentially, each one operating completely different autofocus modes. I never conceived of it, and might not have even though it that interesting if you’d merely described it to me, but after using it, it’s awesome. ☺️ Yep. I have no issues with my pinky falling off the bottom, even without a portrait grip attached – which is perfect, because the Dx line’s integrated portrait grip adds too much hand grip length, and heft. Wifi. But only if you actually provide a remote control app that’s full-featured. Don’t even bother including your current wifi system. I already had to buy a CamRanger because of your half-arsedness. 😤 Unsurprisingly continued disappointment here. Nikon appear bizarrely incapable of implementing connectivity intelligently, let-alone well. Provide an AC adapter for what it actually costs – i.e. $5. $120?! Are you insane? Here’s an idea: just integrate USB 3 as a USB-C connector (or better yet, Thunderbolt 3). Single-port AC power, clean video output, and tethering. And in that case, give me at least two such ports, so I can tether and AC power simultaneously. 😠 Still no convergence on a superior power & connectivity solution. Yes, there’s USB 3, but that’s really not very impressive nor useful to begin with in its current incarnation. Still no sensibly priced power tethering option. Sigh. Touch-screen. Surprised to see it so far down the list? Meh. All I really want is double-tap to zoom and touch-to-focus. 😃 I’m going to give Nikon extra due on this one, because while yes they did a touch screen, and the implementation is decent (though the inability to use touch to change settings etc is a dumb omission, and stark in contrast to their much cheaper DSLRs which do support that now). But what really pleases me is actually the resolution & image quality generally of the screen. I evidently didn’t appreciate how much this matters – given I left it off my wishlist entirely – but in hindsight I really do like the upgraded rear LCD. Kudos, Nikon! Less mirror slap. The D500 has a pretty hefty thwack that you can easily feel shocking into your hand, and it produces serious sensor-motion blur at even moderate, let-alone genuinely low, shutter speeds. It’s actually a far greater disabler in low-light or narrow-aperture photography than the image quality off the sensor itself. Electronic front & rear shutters. Like the D850 now has. Ideally this wouldn’t compromise shooting otherwise – as sadly it does with the D850 – but even with the D850’s implementation, it’d still be exceedingly useful in things like time lapses, for combating the pretty horrendous mirror slap the D500 has. More accurate and consistent autofocus. I talked about autofocus points, and some of the specs that imply accuracy & consistency, but I should have just said: give me an autofocus system that actually bloody works reliably. The D500 continues the Nikon (and in fairness, DSLR-generally) tradition of troublesome autofocus. From systematic focus errors in bodies and body+lens combinations, to limited abilities to even manually correct for that in the camera (really, a single adjustment setting for the entire lens?!). The new “autotune” feature for autofocus adjustment is a nice notion, and it’s certainly better than nothing, but in practice it isn’t that reliable itself, and it only really scratches the surface of the autofocus issues. I run Einstein@Home, using both CPU cores & my GPU. Other than a few month period where Einstein@Home was issuing broken GPU work units, I’ve been successfully doing this for years, I think. Longer than I can really remember, in any case. 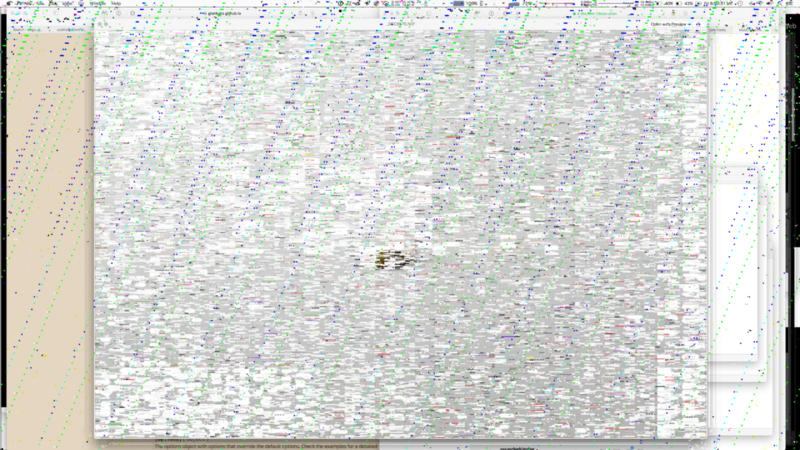 It appears, however, that 10.12.2 has introduced some serious issues impacting those GPU tasks. 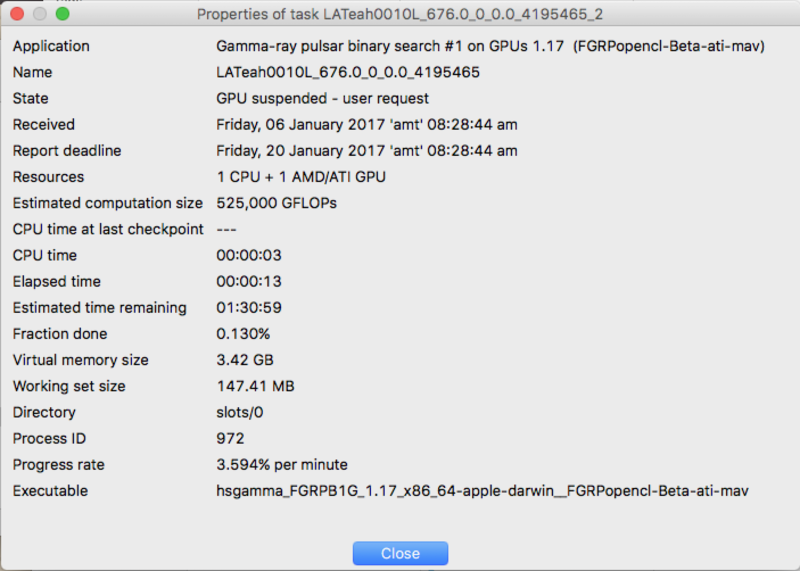 While there’s always been occasional issues with performance while running these GPU tasks – e.g. Amazon streaming video drops frames – I’ve not had any major complaints. That’s what I get when I render a Nikon NEF file, pretty much anywhere in the system. The exact symptoms of the issue seem to vary depending on where & what type of NEF file I render – e.g. rendering them in Preview mostly constraints the graphics corruption to Preview, and doesn’t readily lead to the whole system hanging. Using the Finder for its previews, or Quicklook, however, very quickly leads to massive graphics corruption and, for Nikon D7100 NEFs, quickly hangs the system entirely. Oddly, Nikon D500 NEFs don’t tend to cause immediate system hangs, but will prevent the system restarting or shutting down – it ends up hung at a black screen, after seemingly closing the window server, with a very consistent pattern of corruption and a frozen mouse cursor. I never saw this, or anything like it, prior to the 10.12.2 update. Sigh.